On a bright April morning the tiny delegation from Germany is greeted by Numbur and Karyolang, the Holy Mountains. The news of recent outbreaks of violence has reached us via newspaper and the internet as we complete the preparations for our journey. The German Embassy in Kathmandu advises caution. Most of those who have been enthusiastic about participating in our anniversary trip decide to stay at home. 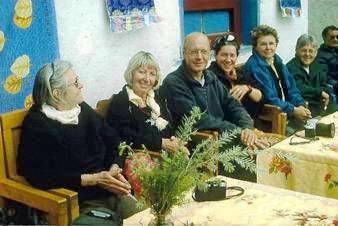 Just four fearless ladies, sponsors of our children - Doris and Marianne from the south of Germany and Birgid and Sigrun from the north - accompany my husband, Werner Dietrich, and me, Anneliese Dietrich, who together with Ngawang Jinpa Lama founded the school in the small monastery of Phugmoche ten years ago. Sigrun's daughter Silke and her husband Klemens strengthen our tiny party. Silke is a teacher in Hamburg. 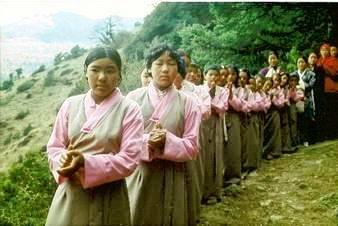 Last autumn while she was working as a volunteer in Phugmoche, Maoists destroyed the administrative centre in Salleri. 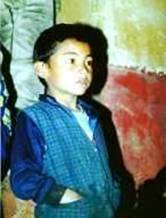 There were many deaths on both sides - policemen and soldiers as well as Maoists. 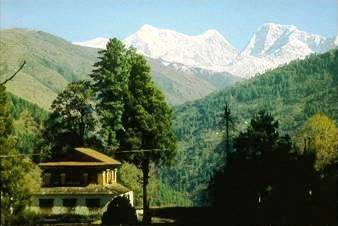 Salleri is only half an hour on foot from our airstrip at Phaplu, and about six hours' walk south of Phugmoche. Somewhat cautious we emerge from the little 16-seater plane of Shangri-La Airlines. 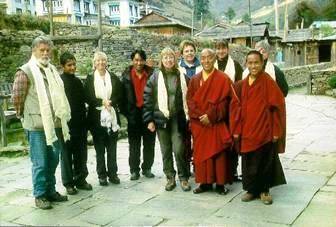 Namgyal and Motiram, two of our teachers, greet us. They are happy, even grateful, to see us at this place where the world seems to end. 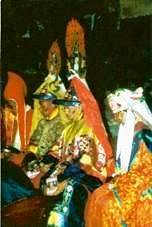 The Lama is unable to leave the village of Junbesi as he is one of the principal actors in the religious masked dance celebrations of the Dumjhe Festival. 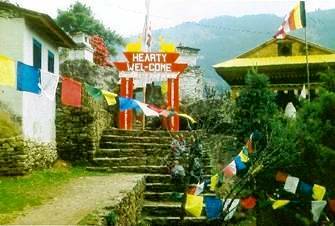 Junbesi is the main village of the Solu Sherpa. 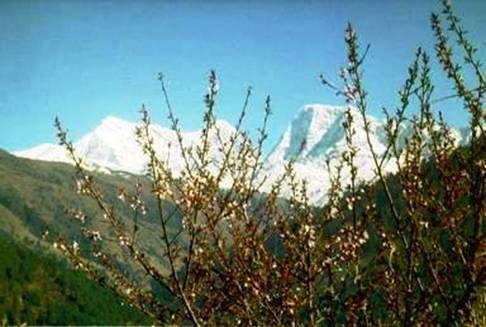 Spring sun, blossoming trees and the shining white mountains which are our friends' protective gods, soon banish any anxieties we may have had. 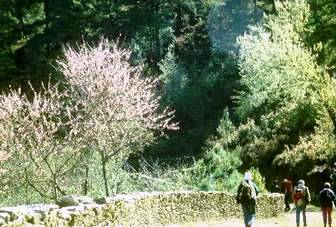 Three hours on foot later we see the village of Junbesi glimmering green in the bright sun between the mighty tree trunks of a shady pine wood. 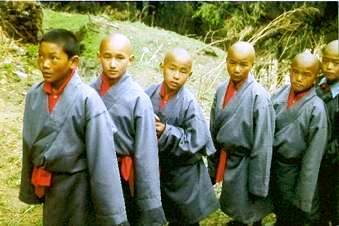 This is where Ngawang Jinpa Lama and our senior student, Kusang, are waiting for us. But others as well, friends whom we have known for long-time, are happy to see us. We hear the friendly greeting namaste, namaste: welcome! Many of the old friends from Europe have not been here in these uneasy times. Even above the holy stupa at the entrance to the village the Maoists have hoisted their red flag with hammer and sickle on it. 'Long live people's war' is still visible on the wall of the school. Somebody has crossed out the word 'war'. 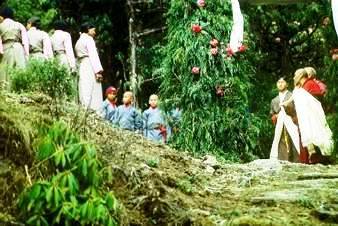 The same evening the ancient Black-Hat Sorcerers, the Shanag, perform their dance drama in the temple yard under the watchful eyes of the shining golden Odpamed, Buddha of the Western Paradise. 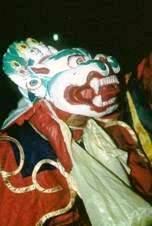 The Shanag are the mysterious masters of meditation in the Tibetan Cham Mask Dance. Mahakala, the Great Black Protective God, and the lion-headed Senge Doma, Mistress of life and death, arouse dread and fear. With wide and solemnly swinging steps they dance in the dark of the night to the shrill or monotonous sounds of cymbals, bone trumpets and bells. 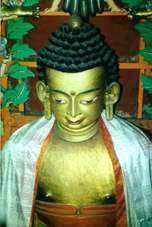 On the sacrificial altar, 108 butter lamps are alight. 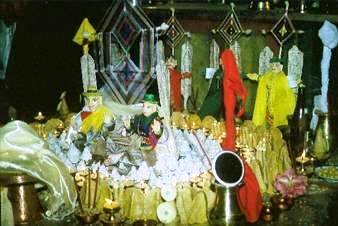 They surround Pho-Mo-Lud - a male and a female figure made out of dough - who is at the centre of the substitute sacrifices. In the dark of the new moon night the congregation of the Shanag and the Gods carry out the sacrifice. 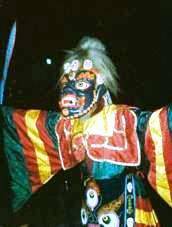 The figures into which the Shanag have transferred the destructive spirits are accompanied out of the village amidst warning whistles and shouts. The atmosphere at the ceremony seems to be more serious, and it impresses more than in previous years. 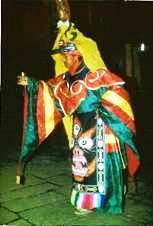 The holy dancers mean to ward off a massive threat. Onlookers in splendid attire or barefooted like this boy are fascinated. 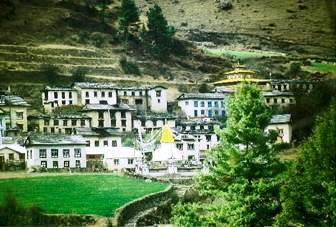 We leave Junbesi behind us and climb up to our school, towards Phugmoche, which towers next to the small monastery high up on a huge rock. 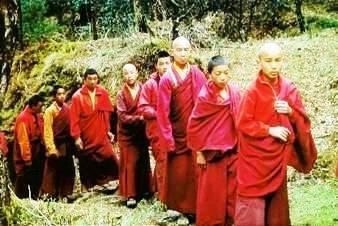 The senior students in their red habits attend the religious classes. 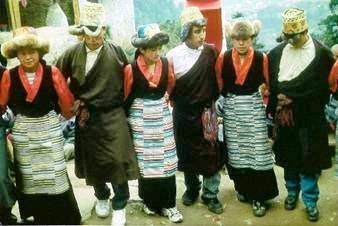 Our girls in the traditional Sherpa dress, light grey with pink blouses, the small boys dressed in grey chubas with red shirts, all newly made. 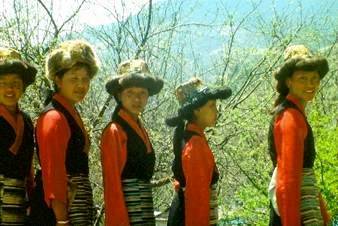 Under the bright April sun we meet the dancers from the village of Pangkarma which consists of sixteen houses. Large banners welcome us down at the base of the rock and then higher up at the entrance to the school. 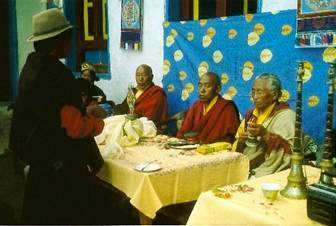 The spiritual leaders are seated in front of the school buildings. 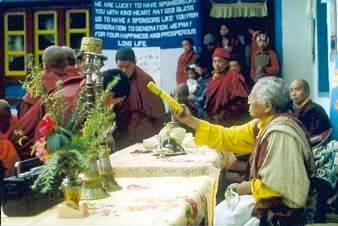 Lama Tenzing from Junbesi directs the ceremony and blesses the participants in the festive performances. The guests enjoy a song sung by the teachers. 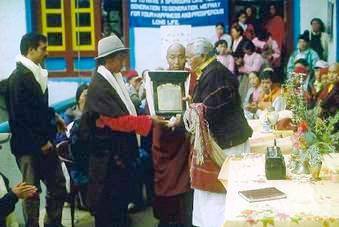 Lama Tenzing presents Anneliese Dietrich with a bronze engraved plaque set in a carved wooden frame, titled 'Witness to Excellence'. It is decorated with a white scarf of honour. We learn what blessings we have brought to the valley. Not only have we given the children from poor families an opportunity to receive education through the establishment of the school, by providing health care we have also had a positive influence upon their overall development. 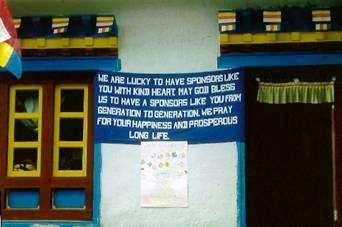 Our sponsors and donors receive seats of honour, and their support is acknowledged on a banner. 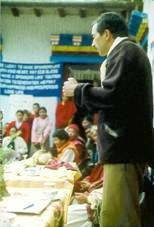 'Govinda-Sir', one of our teachers, entertains us in a good-humoured, witty speech fitting to the occasion. 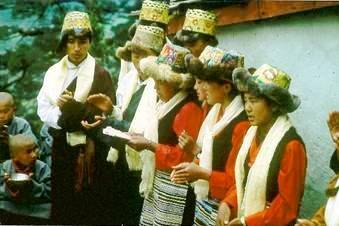 Not only do the young people from Pangkarma dance, they also sing in the sturdy, melodic voices which we remember from the Tibetan high plateau. 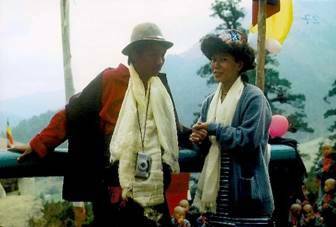 The teacher’s ´Nyima-Miss´ and ´Namgyal-Sir´ stand somewhat apart from the main festivities relieved that the ceremony has indeed gone off so smoothly. the guests from Germany have brought sweets with them, a seldom but much appreciated treat. They are consumed at once - who had stomach-ache? 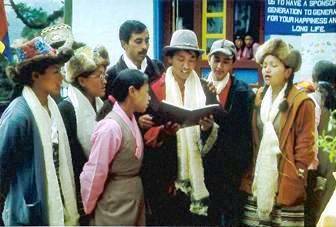 Tsering Dolma from Pangkarma and Chyoti from the southern Sherpa country dance with Chepal from the yak pasture and Sonam from Tragsindu Pass. 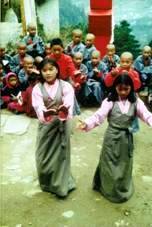 Their graceful dance from the Nepalese hills charms us. 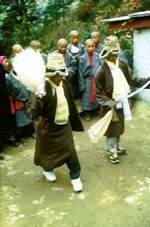 Finally, in an ancient wedding dance with sword and yak tail, our advanced students Rinji and Ang Nyima from Pangkarma honour their patron gods, Pho-Iha and Dra-Iha, which the Sherpa once brought from the far east of Tibet to their new home in Solu. 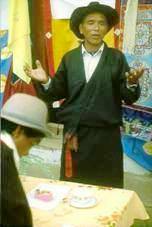 Besides being a student at Phugmoche himself, Rinji teaches the traditions and the mother tongue of the Sherpa as a ´Sherpa volunteer´. 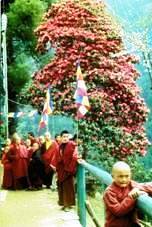 We say good-bye to Phugmoche, to its red rhododendron trees in full bloom and to the magnificent Solu Valley. Our thoughts are with the children at Phugmoche School. 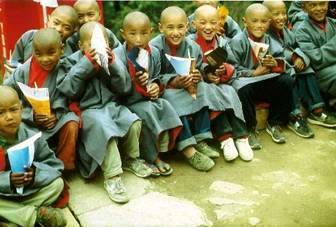 In ten years it has developed into the most beautiful school we have seen in Nepal. 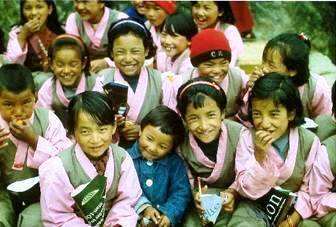 The children take learning seriously and have understood that it is a privilege to go to school. Our teachers are committed and excellent. The educational standard of our schoolgirls and schoolboys is in general so high that when they switch schools they are soon to be found amongst the best students of their new classes. We participate in creating a wonderful project here, at the end of the world, in the last valley beneath the ice capped peaks of the highest mountains on earth. That fills us with joy and gratefulness and - despite all threatening signs: with hope.